General term (Hybrid Golf Club) for any club featuring characteristics of a wood and an iron. Hybrids typically feature wood-shaped heads and iron-length shafts, and have become very popular among both amateur and professional golfers in recent years. The most widely used hybrids are those meant to hit the ball similar distances to the long irons (Nos. 1-5). The head shape and shaft length of hybrids makes them easier to hit solidly while producing higher trajectories. Hybrid clubs are generally numbered 1 through 9, with a loft range of 14-42°. They’re also commonly used for greenside chip shots. 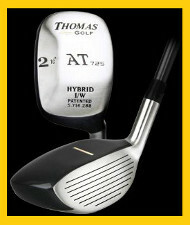 Among hybrid clubmakers, Thomas Golf (www.thomasgolf.com) offers a wide variety of styles and lofts.